The use of replaceable cartridges gives modern water treatment equipment amazing versatility. The ability to use a standard filter vessel design that can be applied to numerous purposes, and to change the purpose at will simply by replacing the inner cartridge, allows filter users to address an almost endless number of water treatment issues. Below are some general considerations that help put residential filter cartridges into perspective. Axial Cartridges: Water enters one end, flows through the length of the cartridge, and exits the other end. Radial Cartridges: Water passes through the porous walls of the cartridge, flows to the center, then exits at one end. Cartridges can be used for many purposes, but some generalizations can be made. Sediment Cartridges: The purpose is to remove particles with a physical size from water. The particles can be very large, like sand, or very tiny, like colloidal matter that can be removed by only the very tightest of filters. Bacteria and cysts can be removed if the filter is tight enough. These cartridges are usually specified with a “micron” rating to describe the relative “tightness” of the cartridge–the size of particle that the cartridge will trap. Wound string (polypropylene). These look like string wound around a core (because that’s what they are). Spun (melt blown) polypropylene. A specially prepared material with a cake-like appearance. Pleated (usually) polypropylene. Accordion-style arrangement of thin filter material. All three styles are radial–water flows through the wall to the center. The first two styles have the advantage of “depth,” but pleated cartridge have considerably more filtering surface area. 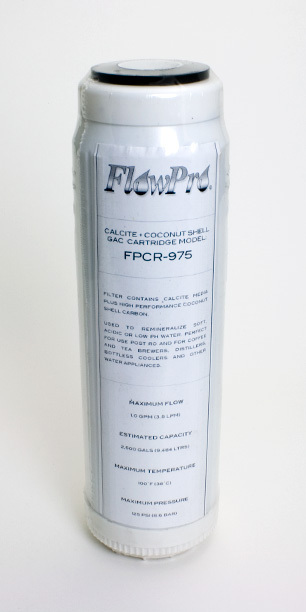 A radial flow 2.5″ X 9.75″ Carbon Block Cartridge. assigned a micron rating to indicate its tightness. Other media, especially lead removal resins, can be added to the block, but media other than carbon are not normally used in this format. Carbon blocks are always radial flow cartridges. Carbon is a universal medium, used widely to remove chemicals and improve taste and odor. Media Cartridges. A great variety of granular media and resins can be put into cartridges. Media cartridges are virtually all axial flow. Among the many applications are treatment for chlorine and chloramines, taste and odor, arsenic, fluoride, nitrates, lead and heavy metals, pH, hardness, iron, manganese, and more. Media cartridges are not usually given a micron rating. Ceramic Cartridges. Ceramics are a special breed. They are made like carbon blocks but from a ceramic material. Their main purpose is very fine filtration to remove cysts, bacteria, and viruses. They are radial cartridges, and some, built in a special screw-in format, are known as “candles.” Ceramics filter in the sub-micron range and water flows slowly through them. Size 1: 2.5″ X 9.75″. This is the most common filter size. It is used for drinking water filters and sometimes for light duty “whole house” sediment filters. Size 2 2.5″ X 20″. Used for light duty whole house applications. Size 3: 4.5″ X 10″. This size is commonly called “Big Blue” in the industry, because of the familiar blue housings it fits. Common uses are for light duty whole house carbon filters and high flow sediment applications. Size 4: 4.5″ X 20″. Called 20″ Big Blue. 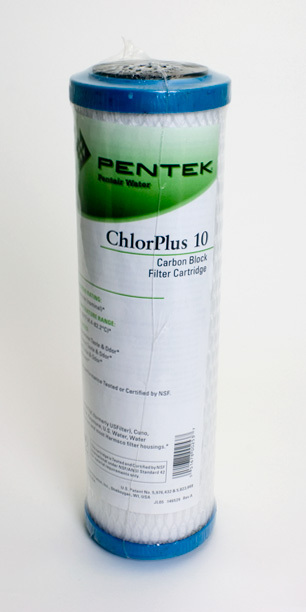 Used for whole house carbon and media filters and high flow sediment applications. For pictures and much more information about filter cartridges, please visit Pure Water Products cartridge menu.